We’ve all had that dream: it’s an important day and you show up totally unprepared and, probably, naked. For writers who take the National Novel Writing Month (NaNoWriMo) challenge, this most commonly occurs on Day One: you’ve brewed your warm, comforting beverage of choice, assembled your meticulously curated writing playlist, filled the bathroom with catnip and locked the cats inside, and carefully arranged all the implements and tchotchkes on your desk into a pleasing geometric pattern. Then you sit and stare at a blinking cursor and have no idea what to write. Whether it strikes at the very beginning of a novel or right at a crucial middle part, writer’s block is frustrating and potentially devastating. The most essential tool any author can have is a list of surefire ways of breaking out of its cold, clammy clutches. Here are ten creative ways to smash out of a creative funk. Your first step, always, should be to read a few of your favourite books. Since NaNoWriMo goes pretty fast, don’t try to read a whole novel, just skip to your favourite parts. Spending a few minutes with a beloved story usually gets the juices flowing. Alternatively, read a hot new title everyone’s talking about to stoke those fire of jealousy, one of the best motivators known to man. Another approach is to sit down with some of the best writers in history and ask their advice, which you can do by picking up a book like Stephen King’s On Writing or Anne Lamott’s Bird by Bird. Or, depending on your taste in literature, a wilder example:Charles Bukowski’s On Writing, or Ray Bradbury’s Zen In the Art of Writing. You get the idea. A great trick is to start writing about a frustrated writer. Writers as characters can be lazy, yes, but even if it’s a false start that has to be scrapped, writing about your own situation might offer a glimpse of an escape route. And writing about yourself is (usually) easy. Another trick is to simply begin writing without any concern over what the story is, who your characters are, or how in the world you’re going to finish those 50,000 words in thirty days. Just start describing something, or sketching a scene, anything. Just using your fingers and brain to put words on the screen can act like a starter motor, cranking your engine into gear. All writers develop a mechanical way of writing: the software used, the specific pen or pencil, the location of their work space. If you’re blocked, try changing things up. Switch to longhand if you work on a computer, or go sit in the garden with a laptop instead of rigidly upright at a desk. A change of mechanics can shock your brain into exploring a new way of working and thinking. Sometimes what blocks a writer is the pressure of getting 2,000 words in every day for a month. Try not paying attention to word counts for a week, instead just concentrating on telling a story, and often the pressure relief will un-crimp your creativity. And don’t forget, some incredible novels are less than 50,000 words, The Great Gatsby and Slaughterhouse-Five for example. Sometimes writer’s block isn’t some mystery brain injury; sometimes it’s your subconscious trying to tell you you’re headed down the wrong path. Back up to the last major plot decision you made and see if there’s a more interesting choice you missed. Or, while it might break your heart, ask yourself if you should be writing something else entirely. No novel, no matter how creative, can beat actual events for sheer twists and turns and thrilling drama. If the story won’t come, seed your brain with some of the most interesting (and true) stories ever told. Bonus: reading history trains you in how things actually happen, ramping up your verisimilitude skills. Some writers like to work randomly, plopping down when the mood strikes and scribbling out a few hundred words here, a few hundred words there. Some go weeks without writing a word, and then hole up in their office for a month straight. As romantic as that sounds, you may work better with a rigid schedule. Try swapping your approach: go random if you normally have a schedule, and treat it like a job if you’re normally a random. Taking breaks is one of the most powerful tools a writer can use. Sometimes that panic over lost time is what’s blocking you in the first place. Take an hour and listen to some great music, or eat something delicious, or go for a walk in a beautiful spot. Feeding the senses stimulates creativity – think of Proust and the Madeleine! Good luck, and keep writing – you are almost there! Just know that every single one of us is also going through this same pattern too, so at least you are not alone. Roll with it, and keep writing! If you are doing NaNoWriMo, you will know by now that just getting it done is a challenge. So in order to provide you with some inspiration to keep going, here are 8 bestsellers that started out as NaNoWriMo projects. The Night Circus, by Erin Morgenstern. The buzz for this best seller was everywhere in 2011, and judging by its rapturous reviews and strong sales (not to mention the fact that the movie rights were snapped up by the producers of the Harry Potter films), the hype was warranted. Not bad for something that began as 50,000 words of unconnected scenes and imagery. What eventually became The Night Circus began life in 2004, seven years before it was finally published. Fangirl, by Rainbow Rowell. Granted, Rowell had already published her first novel, Attachments, and sold her second, Eleanor & Park, when she sat down to write Fangirl in 2011. And though the book ended up being double the 50,000-word monthly goal, she credits the exercise for forcing her to dive into the world of her story and characters like never before, producing “some of the bravest writing” she’s ever done. Wool, by Hugh Howey. Howey’s dystopian sci-fi novel is one of those credited with putting self-publishing on the map: after selling tens of thousands of ebooks directly to readers, he signed a six-figure deal with a major publisher. Wool was originally issued as five separate novellas; Howey wrote three of them (and even published one!) in November 2011. The Darwin Elevator, by Jason M. Hough. Hough’s first NaNoWriMo attempt resulted in a 50,280-word novel that “fell apart” after one good chapter. His second eventually became a New York Times best seller, the first in a trilogy of sci-fi thrillers that has earned the author comparisons to recent Hugo Award–winner John Scalzi. Cinder, Scarlet, and Cress by Marissa Meyer. Each of the three books in Meyer’s successful YA series of futuristic reimaginings of classic fairytales began as NaNoWriMo projects. How’s that for consistency? Hopefully, proof that all your pain can amount to something positive will have reignited those burning desires that got you taking part in the madness in the first place. Now, back to the writing desk with you! Tackling NaNoWriMo, but feel as though you need all the help you can get? I’ve got 10 winning NaNoWriMo strategies that any writer can use to make it to their 50,000-word goal. Even if you’ve never even heard of NaNoWriMo until right at this moment, I’ve got you covered. Every November, hundreds of thousands of people across the globe buckle down to write a 50,000-word novel in 30 days. What began as a writing contest between friends has grown into a huge non-profit organization that provides creative-writing materials to schools and libraries around the U.S. In addition to its flagship event, NaNoWriMo now hosts Camp NaNoWriMo in April and July, which offer participants more flexibility than the November session. I’m not going to sugarcoat it: NaNoWriMo is not easy. Fifty-thousand words may not seem like a lot, but squeezing it into 30 days can be a nightmare if you’re not prepared to take on this particular beast. At the end of the month, your manuscript may look nothing like a bestseller, but you should at least have a firm foundation on which you can build your dream novel. NaNoWriMo manuscripts have a lot of… potential. At 50,000 words, your novel will probably still need roughly 30,000 words, at the very least, to make it marketable to literary agents. It will be a whole lotta rough, with a few diamonds buried deep inside it, and you will still have weeks of editing and re-writing and re-editing ahead of you. Don’t get discouraged by this. Just accept it as part of the process and keep moving forward. Your novel won’t be pretty when these 30 days are up, but that’s no reason to give up on it. 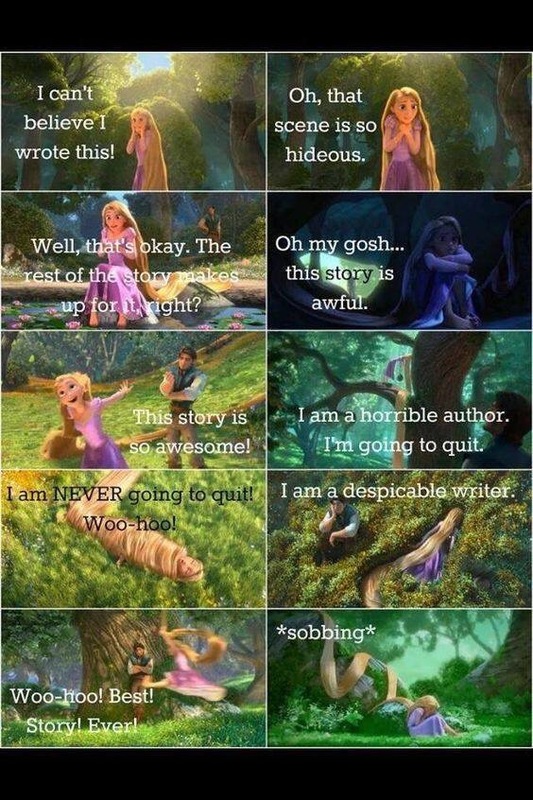 Just remember that this is the worst your manuscript will ever be, and keep writing. You have more free time than you think you do! You just have to find your writing time and commit to it. I like to use a calendar to block out my time for the week in 30-minute increments. Black out your work hours, mealtimes, and any other commitments you have, and you’ll see what kind of time you have left to work with. Pro tip: Leave yourself a few hours of free time each day, so that you can veg out if you need to, and also so that you can work for longer on your NaNoWriMo manuscript on the days that you’re really feeling it. Believe me, I know how hard this is. Turning off your Internet makes about as much sense as shutting off your water or electricity. If you can’t turn off your Internet entirely, there are plenty of less extreme options that will have the same effect. App-blockers, such as Freedom and SelfControl prevent you from accessing your favourite time-wasters during your writing periods. For $20, you can download Write or Die 2: a unique word processor that forces you to keep writing – or else. For those of you who cannot be trusted with a computer or Internet-connected device at all, there are still distraction-free ways of getting your NaNoWriMo manuscript written. Lifehacker recommends purchasing an old word processor off the Internet, because its drawbacks, such as only displaying four lines at a time keep you focused on writing instead of editing (see Point No. 1 above). If you want a sleeker, more expensive experience, the Freewrite smart typewriter may be the word processor for you. I’m sure plenty of writers out there recognise this struggle: You sit down to work on your manuscript, but find yourself so easily distracted that you decide you cannot work until the dishes/laundry/dinner/taxes are done. But the next day, when you’re faced with an hour-long wait without your laptop, you’re chomping at the bit to get back to writing. We’ll tackle the problem of environmental distractions in Point No. 9 below, but for now, let’s focus on ways that you can take your manuscript with you everywhere, so that an unexpected wait doesn’t derail your writing plans. If you purchase a word processor or use pen and paper, you’re already good to go. Just make sure to take your novel-writing tools along with you wherever you may roam. Don’t like those options? You should already be in the habit of backing up your novel on a flash drive that’s kept in a safe place, but having a duplicate drive that you carry on your person will allow you to work on your manuscript in any Internet cafés or computer labs you may pass. You might also consider using Google Docs or Dropbox instead of Microsoft Word, as Docs are accessible from any Internet-connected device, and can be exported as .PDFs and .DOC files. NaNoWriMo divides writers into two categories, Plotters and Pantsers, but there’s a wide spectrum between the two. Plotters plan out as much of their novel as possible before NaNoWriMo begins, in the hopes that all their planning will prevent writer’s block and keep them motivated to finish. Pantsers, on the other hand, fly into NaNoWriMo by the seat of their pants. They might have some idea of what they intend to write about, such a genre they wish to write, the specter of a main character, a vibrant snapshot of a particular scene, or even a loose concept of what will happen over the course of their story, but they haven’t outlined their novel or written extensive character profiles. First-time Wrimos, you may not know which of the two you are, and that’s OK. Neither of these approaches is wrong. Every writer works differently, and some authors straddle the line between plotting and pantsing. If you have some time before NaNoWriMo begins, it never hurts to come up with at least a general concept for your novel, but please don’t let time constraints or pre-writing block prevent you from participating. The NaNoWriMo message boards have lots of resources and support for Pantser success, so there’s no harm in simply diving in headfirst. In order to reach your 50,000-word goal in 30 days, you need to write 1,667 words per day, or about seven pages. This may or may not sound like a daunting task, depending on your past writing experiences, but I will tell you that it’s quite difficult to keep up your 1,667-word habit every single day for 30 days straight. Things happen: people get sick, cats need to be fed, work days run long. Most NaNoWriMo participants will find themselves falling behind their daily targets at some point during the month. The easiest way to fight back against that word-count behemoth is to try to write more than your daily goal as often as possible. Some people like to crank out 10,000 words on their first day, just to get ahead of the curve. If you can keep up that pace, you can defeat the NaNoWriMo behemoth in a week or less. Even if you can’t, those extra words will come in handy when something inevitably disrupts your writing flow later in the month. You already know that your NaNoWriMo draft is going to be crappy, so why not try new things this month? You could throw in an experimental chapter, write meta-fiction, even construct your entire novel based on suggestions from writing prompt Twitter bots or TV Tropes’ “Random Trope” button. Seriously, spend a month playing in the big writing sandbox, and tell me you don’t feel better about your skills as a writer. The next 30 days will be stuffed full of fun writing events to keep you on-track and entertained. NaNoWriMo hosts virtual write-ins and writing sprints for its worldwide community of writers, and you can also connect with liaisons in your area to find IRL meetups. Participate in any and all of these that you can. You’ll make new writing friends to keep you accountable, and you’ll have an incentive to write hard for the duration of every event. There’s nothing worse than sitting down to write and realising that something, anything, isn’t right in your environment. Even the most laid-back writers find their sessions derailed by little nuisances. Make your writing space comfortable ASAP, but don’t let the pursuit of the perfect writing space prevent you from churning out your 50,000 words! The goal is to make your dedicated writing area livewithable. If you can live – and write – without vacuuming/organising/refinishing, then do so! So clean out the cobwebs, dust the shelves, set your light levels and speaker volume, and for the love of all that is decent and holy, make sure your coffee mug is clean, because you need to be writing, not keeping house, for the next 30 days. Raymond Chandler, the author of The Big Sleep, famously said of writing: “When in doubt, have a man come through a door with a gun in his hand.” That’s Chandler’s Law, and you should never forget it. These days, it might seem a little corny to have someone randomly appear, brandishing a firearm, especially if you’re writing high fantasy, or historical fiction of a certain age. But here’s the thing: There’s no way to get stuck when you’ve pulled out this card; having a man rush in with a gun forces you to keep writing. Use it as often as you like, because this is NaNoWriMo, and it should be fun. I wish you all the best of luck and I hope these prompts will help on the days when writing 1 667 words a day for the month of November is hard. When you write for a living, it can be easy to forget that you enjoy doing it for fun. You compose so many press releases, executive speeches and blog posts that writing becomes monotonous and uninspiring. It’s work. Though writing is your job, that doesn’t mean it has to be boring—it shouldn’t be anywhere close. Your ultimate task as a communicator is to make lackluster corporate messages relevant, interesting and inspiring. You can’t do that, however, if you’re in a creative rut.